When it’s time to grow your firm, what do you do? In fact, they all feel more like tips on “marketing for marketing’s sake,” not building an actionable marketing strategy that will help you attract more clients, boost profits, and grow your firm year by year. It may have something to do with the fact that they’re all written by accountants. I’m not saying that’s a bad thing, but you may not want me (or any member of my team) doing your accounting, and for good reason. Accountants aren’t marketers and marketers sure aren’t accountants, which is why I thought this would be a good time to outline how to develop a proper marketing strategy for accounting firms. This is serious marketing for accountants that are ready to take their marketing strategy and their business to the next level. Are you ready? Good, let’s get to it! The world of marketing has moved online. Digital marketing is more efficient and more effective, and that means growing your firm faster than ever. Your digital marketing activities will revolve around your website, so making sure yours is set to achieve your goals is the first step toward success. Your website should be designed with an end goal in mind. Most use the goal of a sale, if they have a goal at all. It’s important to analyze whether or not this is the most effective goal for your site. After you understand that less than 3% of average website visitors are ready to seal the deal immediately, you may decide that you want to build your site with the goal of building your email marketing list through strong content offers in order to nurture prospects toward the eventual close. It’s these considerations that have the most dramatic impact on your bottom line. Education is one of the key concepts of marketing for accounting firms and digital marketing as a whole. Your site needs to represent an educational resource rather than just a showcase of your abilities (services). Include pages that exist solely for the purpose of educating prospects. The more detailed and defined you can be, the better. Your accounting marketing will be an ever-evolving process. Use landing pages in order to incorporate different marketing initiatives into your website more effectively. The pages can be designed with a more specific goal in mind and modified more easily as your goals and campaigns change. As annoying as they may seem, pop-ups typically increase conversions. Add a pop-up when a visitor arrives on your site with a specially designed landing page that directs them toward a goal. Add an exit intent pop-up as well to catch visitors before they leave. Include a special offer in order to capture their email and use it in future email marketing. Your website should incorporate CTAs (calls to action) throughout its design. Include one or more on each page. Use them where they are highly visible. Use them to break up long copy. You should be telling your visitors what you want them to do, and CTAs are the way to do just that. Your clients (and the rest of the world) are spending more time on mobile devices than ever before. That means your mobile presence is more important than ever. Your entire site needs to be streamlined and slimmed down into a “best of” version, where your prospects can quickly identify just what they’re after and navigate from place to place just as fast from any device. Speaking of fast, both your mobile and desktop sites need to be blazing fast to remain competitive. Waiting for pages to load is becoming more annoying as people’s attention spans wain. The world of sales has changed as well. People no longer want to be sold to, and tend not to trust hard sales initiatives. When people don’t trust you, they won’t buy from you. That means that to sign new clients, your firm’s accounting marketing has to change. It’s time to educate people. Time to draw them to you, establish a trusted relationship, and show them that you’re the best option for their needs. 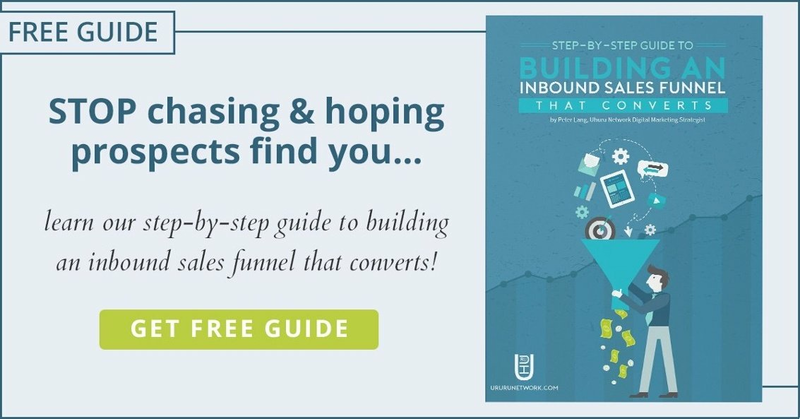 The entire process of building a powerful inbound sales funnel is slightly beyond the scope of this article, but we’ll cover the essential principles to shine a light on the big picture activities you’ll be participating in. And after breaking it down, it is really only 5 steps. Define your ideal buyer persona: Who are you selling to and how can you create marketing messages that reach them most effectively? Create useful and problem-solving offers: What sort of problems/questions do your ideal buyers have and how can you create content that helps them solve/answer them? Write a strong landing page to sell the offer: Speak to your ideal buyer in a way that resonates them. Not just with your copy, but design, images, colors, etc. Place the offer and message in front of them: How can you most effectively place your content offer in front of your ideal buyer? Which channels are your ideal buyers most active on and most likely to convert through? Write helpful articles that can be found by your ideal buyer in search engines: How can you make sure that search engines are ranking your content, allowing it to be seen by your ideal buyer? These steps all boil down to one core concept: You’re attracting customers to you by filling the information/idea gap between where they are and the solution to their problems and answers to their questions. In doing so, you begin to develop a relationship, build trust, and nurture them toward your product. The Secret to Better Business Accounting in 28 Days, Guaranteed! Those who download your ebook will give you an email address that you can use to provide further value, nurturing them toward the eventual conversion. The entire process can be automated, meaning you set it up and sit back while your clients come to you! The following tips will help you make the most of your accounting marketing inbound sales funnel. Remember that people don’t want to be sold to, they want to be educated about your services. The reason companies hire accounting firms is because they make their life easier. They typically don’t understand the intricacies involved in proper accounting, but you do. Help them to further understand accounting and you’ll be developing trust and showcasing your expertise at the same time. Unfortunately sitting down and creating informative content is not the only piece of the content marketing puzzle you’ll have to master. You’ll need to write content that the search engines (Google) find valuable, which means having a basic understanding of SEO, or search engine optimization. Use your keyword(s) in the first and last hundred words of your post. Use related keywords (find them using a keyword analysis tool) throughout the post to help define your context. Increase click-through with emotionally compelling titles. Take the time to respond to questions prospects ask on your blog posts. The fact that they’re taking the time to ask the question means that they’re interested in your content, which is the first step toward converting them to a client. If you have the potential to create videos, do it. Answer the same kinds of questions that your blog content and ebooks are answering, but do it with super engaging video. It will open your content up to new audiences on new distribution platforms, which means better results. Videos are highly engaging, if you create them in the right way. If you look closely at the examples of blog topics I listed above, you’ll see that they are all directed toward different stages of the buyer’s journey. The first stage helps someone realize that they need accounting services, the next stage helps them understand the benefits of proper accounting, and the final stage helps them decide on the right accounting firm. All of your content may not be as direct, but for the sake of making an example, I wanted to show how to effectively use content to nurture prospects through the stages of the buyer’s journey. Not all content is created equally. Remember, that in order to get the most mileage out of each piece you create, you’ll need to create content that will still be relevant in 1, 3, even 5 years’ time. Avoid time-sensitive topics (most of the time), like news and world events. The next part of your perfect accounting marketing strategy is something that will seem more familiar. It involves paying for advertising to people that represent your target market. That may be where the resemblance stops. The beauty of digital marketing is the symbiosis that exists between every facet of the process. It all works together as a cohesive unit to provide a series of hyper-efficient processes that typically result in a dramatic boost in ROI. For example, because you’ve collected emails through your inbound marketing activities, you’ll be able to market to those people on Facebook, as well as people that share similar qualities to that list. With an active population of 1.65 billion users, you can bet your potential clients are on Facebook. The social network represents one of the most powerful digital marketing platforms available to advertisers of any kind. Their paid advertising allows you to reach a more clearly defined audience, more effectively than ever. One of the defining benefits of the Facebook Ads platform is their ability to create some of the most specifically defined audiences of any form of marketing ever. Marketing for accounting firms becomes that much easier when you’re able to isolate the defining features of your existing customers and/or your ideal buyer. Facebook allows you to market to these audiences with a level of precision that you may never have encountered before. It even allows you to marketing specifically to those on your email list, or existing customers in order to upsell your services. Facebook also allows you to market to people who have visited your website via its Pixel. A simple line of code is inserted into your site and, “voila,” you’re able to track who’s been where and done what on any part of your site. The Pixel’s extensive tracking ability is another topic that is beyond the scope of this post, but it’s a feat of marketing mastery. Normally, when a visitor comes to your site and leaves again, you’re none the wiser and miss out on the opportunity to make any further impression on them. Now you’re able to reach them with specifically generated ads that aim at reeling them back in to take part in your offer. The point is, the Pixel makes it easy for you to continue to put your brand in front of potential customers, which significantly improves your chances of them returning to continue through the buyer’s journey. It’s accounting marketing made easy. The best part of this guide is how extensive it is. It’s also the worst part. There is a lot of powerful information contained here, so it’s okay to be a little intimidated. The key is to start. Get your website in line, then start creating content. While you do that, work on developing your paid ad strategy and soon enough you’ll be an accounting marketing master. Remember, the key to successful marketing for accounting firms is to continually be testing and optimizing. Test to see what works and what doesn’t, make changes, repeat. You’re on your way to your best year yet, so don’t look back. Successful accounting marketing is fully within your reach.